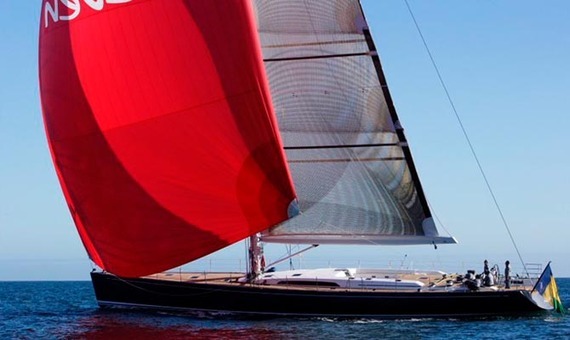 Luxury sailing yacht MRS SEVEN was built in 2008 and is the seventh hull in the yard’s SW100 mini-series, but the first version to be equipped with a raised salon. 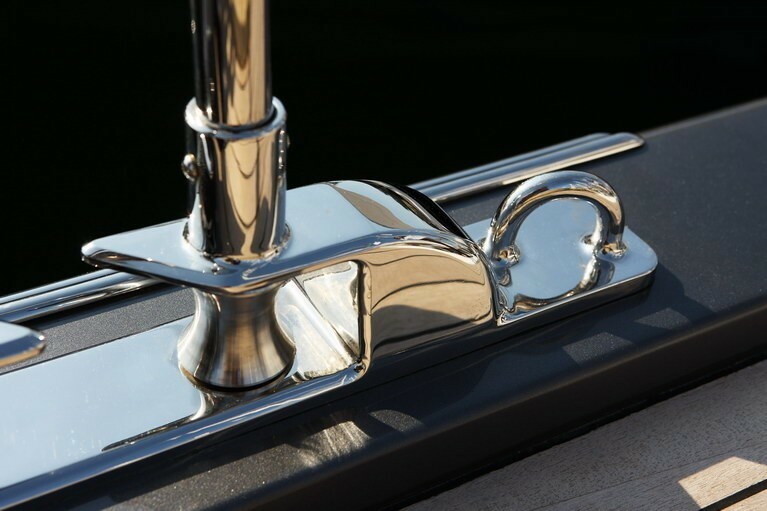 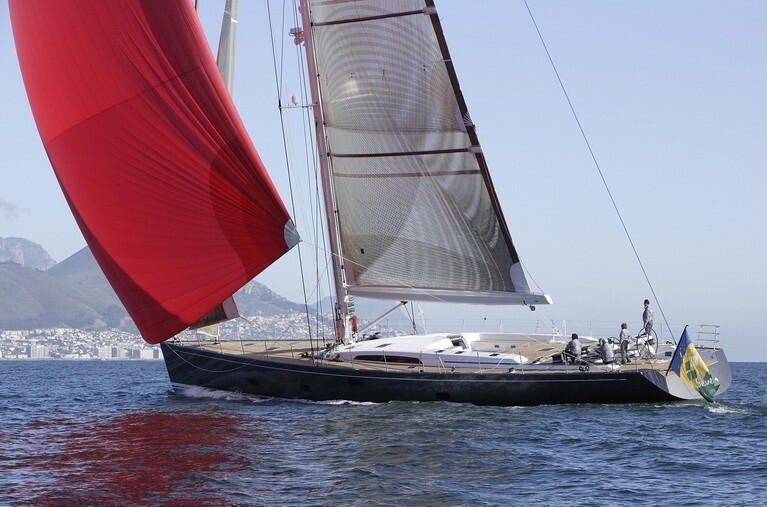 She was designed by Bruce Farr and features an aggressive, sporty, sleek line with a low coachroof and open transom and promises exciting sailing. 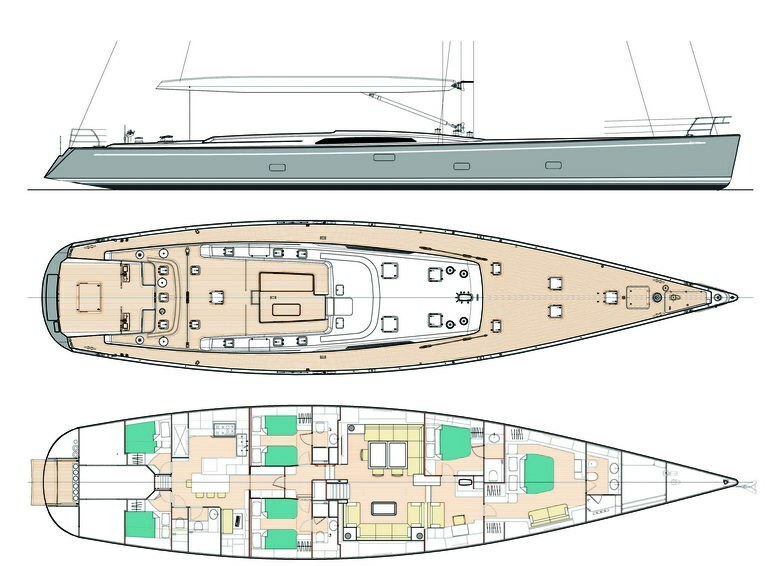 Nauta design was responsible for the general concept, the interior design, and exterior styling and can accommodate a total of 8 guests with a dedicated crew of 4. 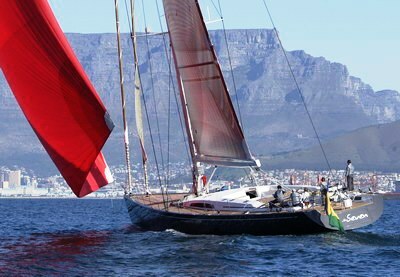 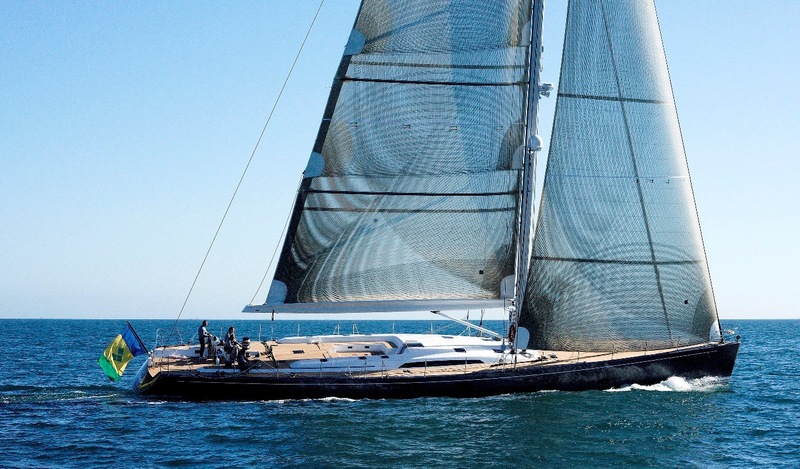 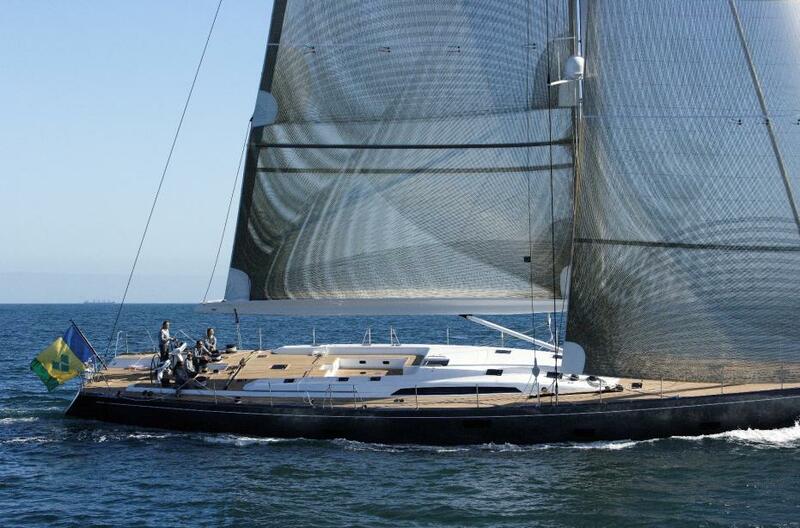 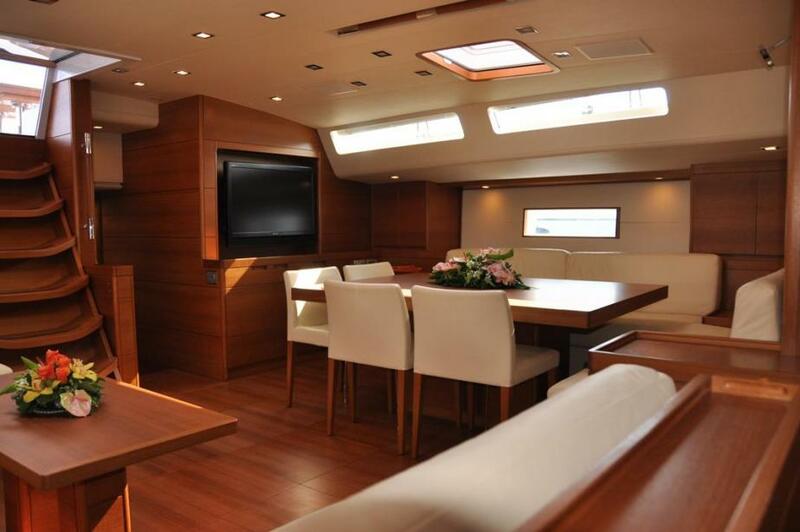 This high-performance sailing yacht boasts a large, well-lit, modern and elegant salon situated amidships. 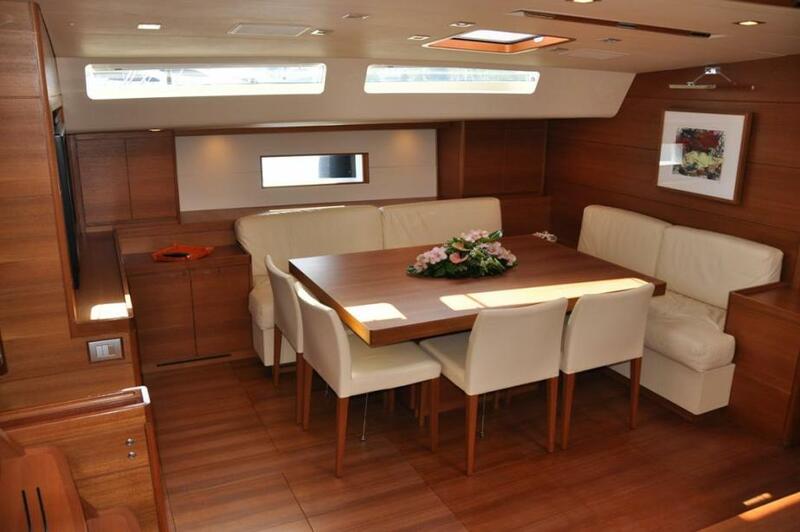 The main salon features a comfortable conversation area on the sofa with cocktail table to starboard and a dining area to port. 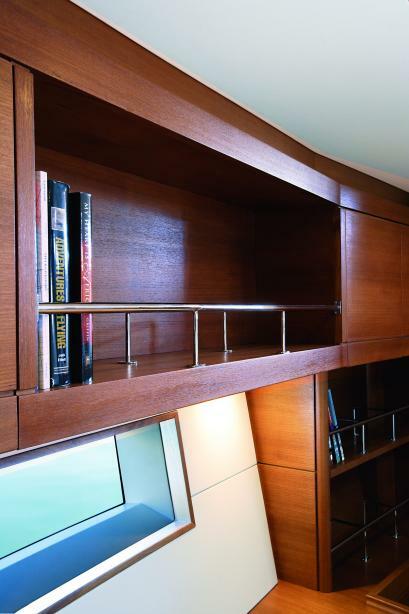 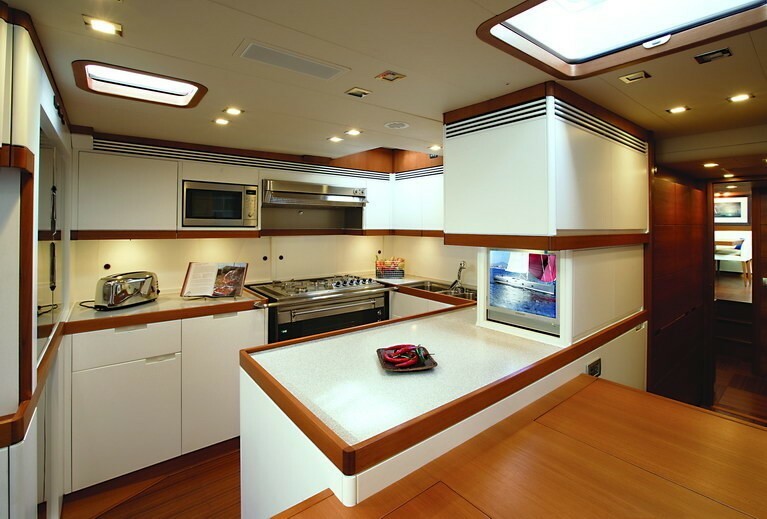 The interior styling adds to the sporty style of this yacht with the use of white color fabrics and contrasting horizontal grain teak furniture. 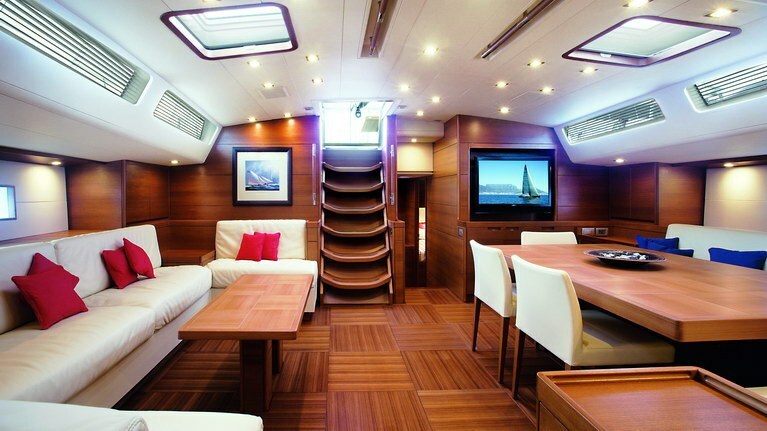 The salon, master cabin, and galley all feature a flat-screen SAT TV, and there is a music system in all cabins and the salon. 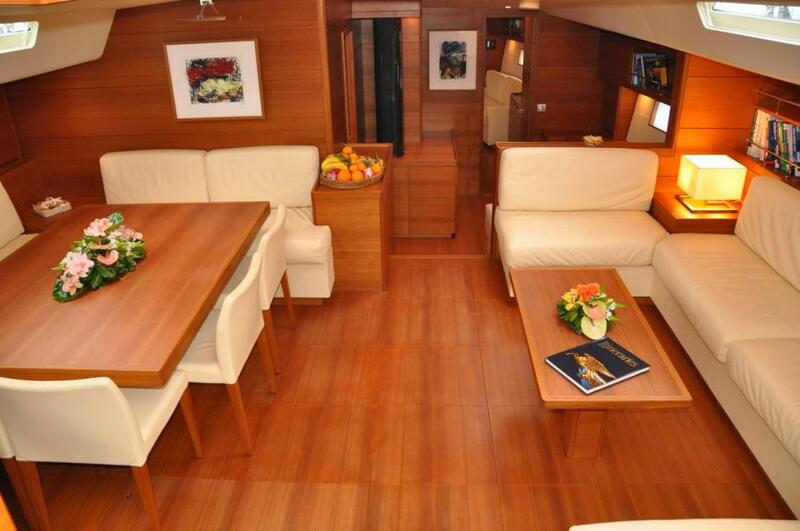 WiFi is available onboard. 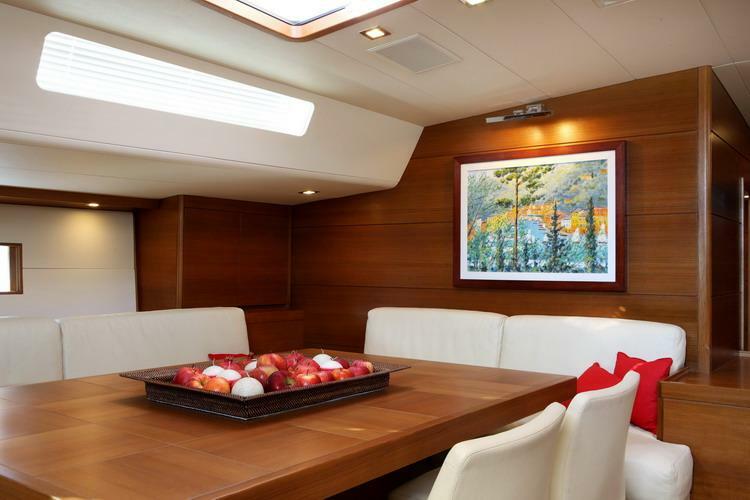 Her large and well-lit salon (thanks to its raised position) is situated amidships and features a comfortable conversation area to starboard and a dining area to port. The sailing yacht’s interior styling has a sporting and modern theme with the use of white color fabrics and contrasting horizontal grain teak furniture. 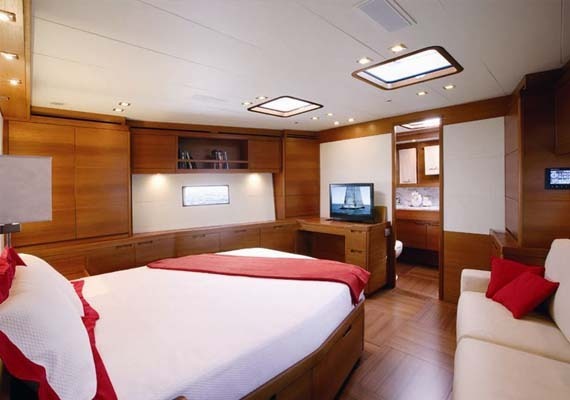 The salon, the master cabin, and the galley feature flat screen SAT TVs, and there is a music system in all cabins and the salon. 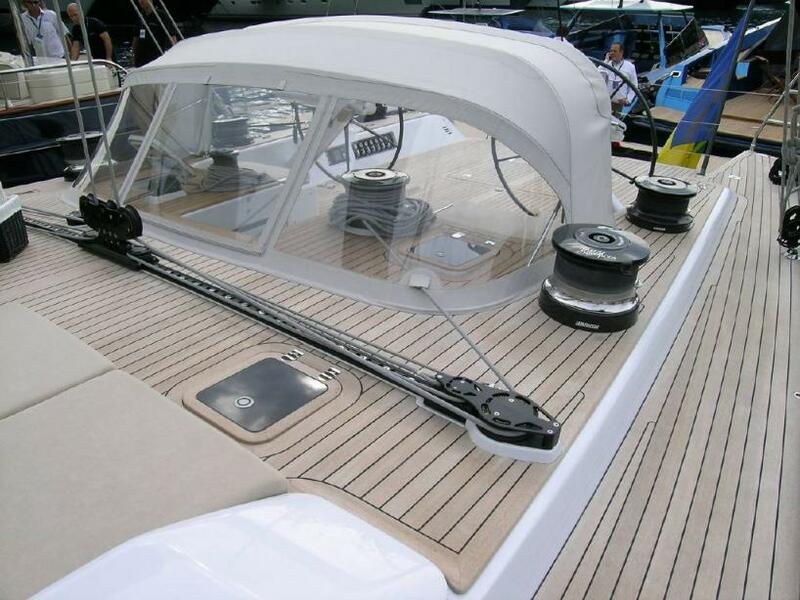 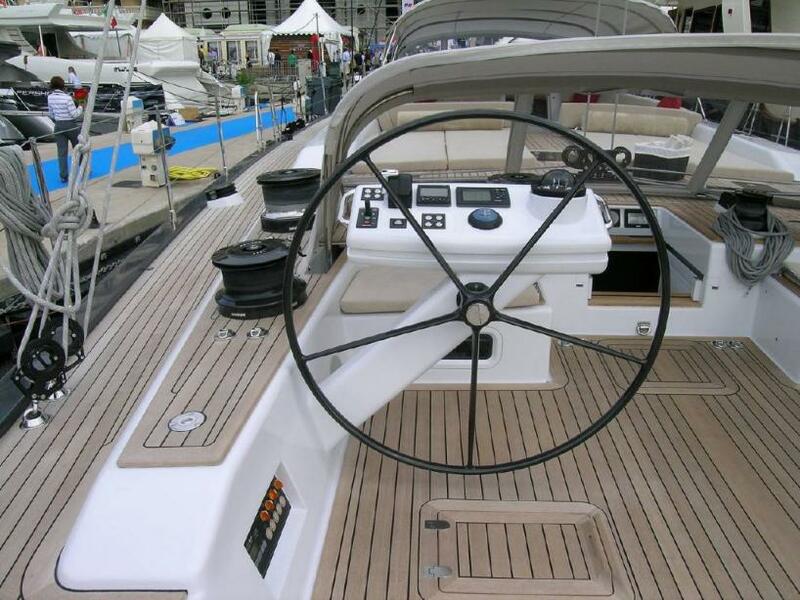 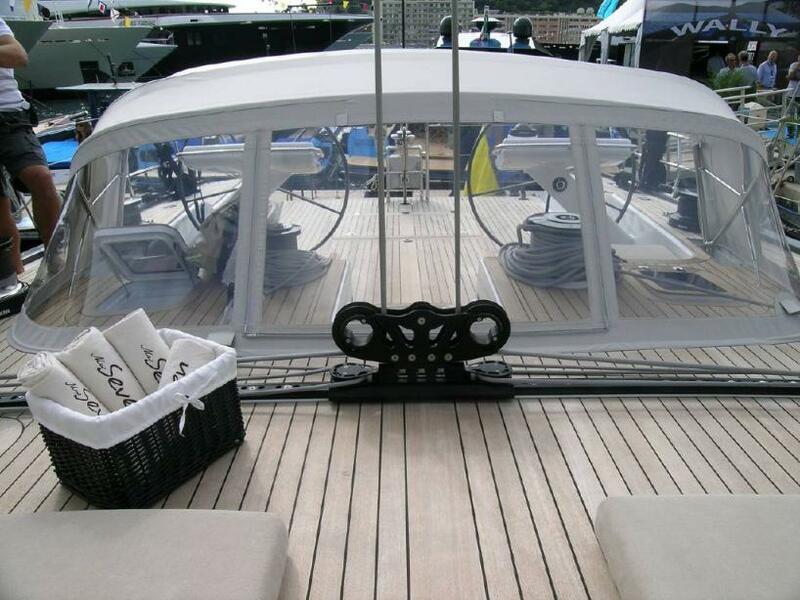 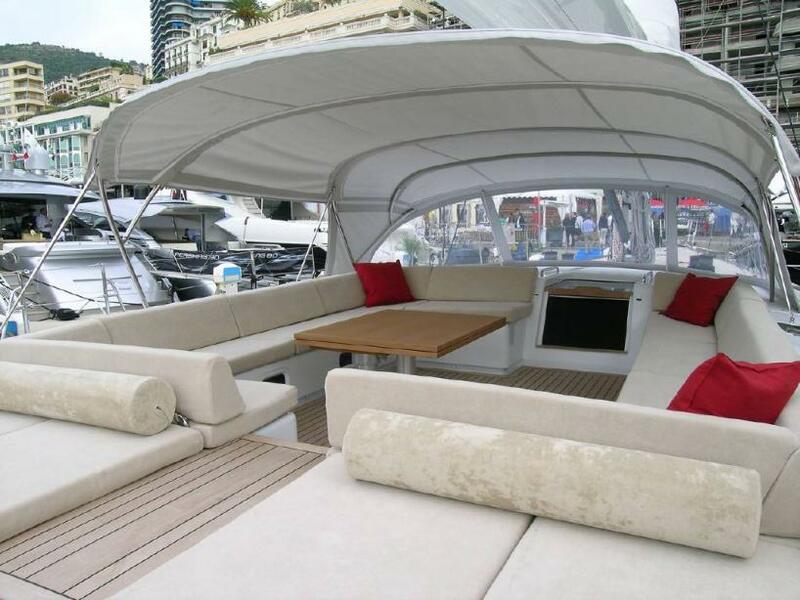 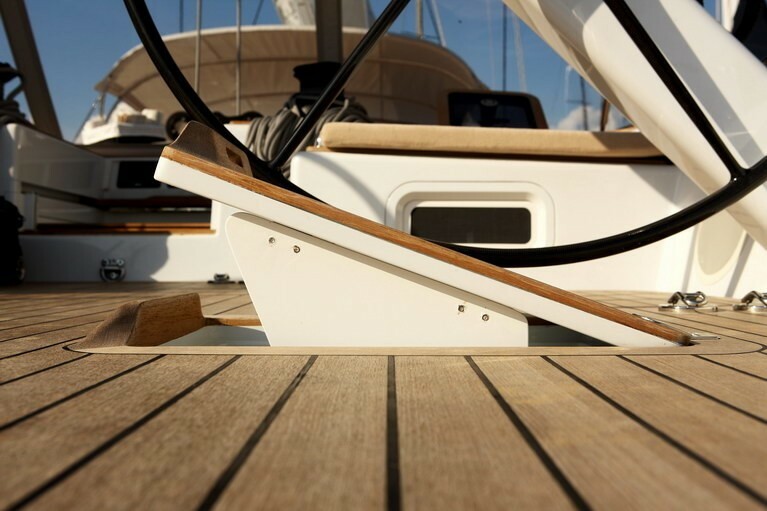 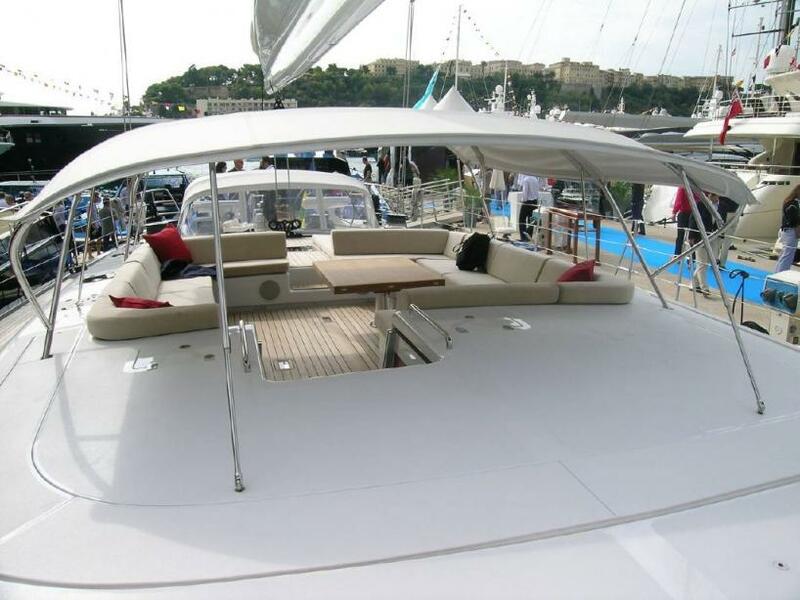 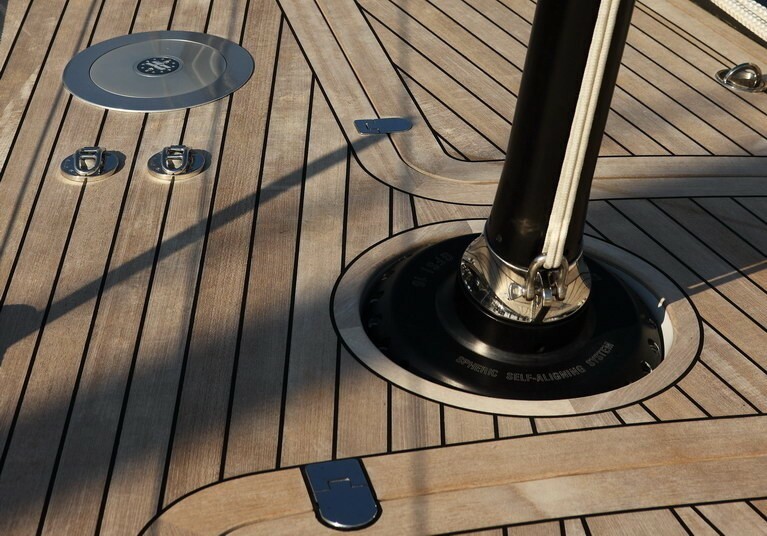 The charter yacht is equipped with a sun dodger over the guest cockpit and a bimini over the steering cockpit for good sun protection. 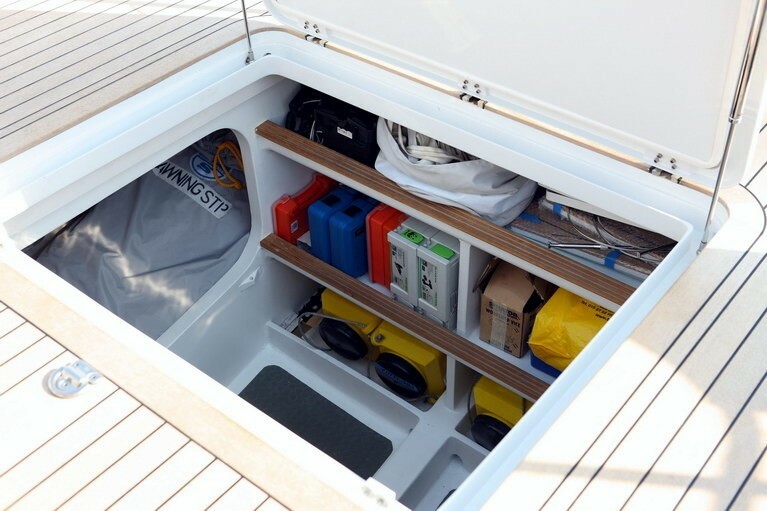 The side windows of the dodger can be opened to allow for air circulation. 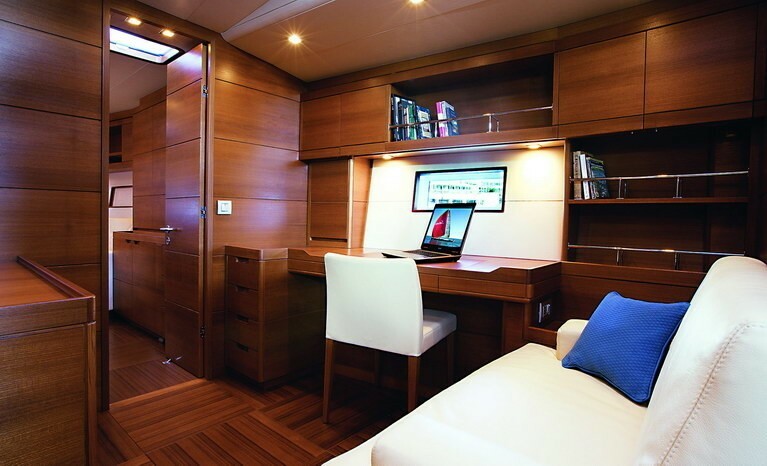 WiFi internet is also available onboard. 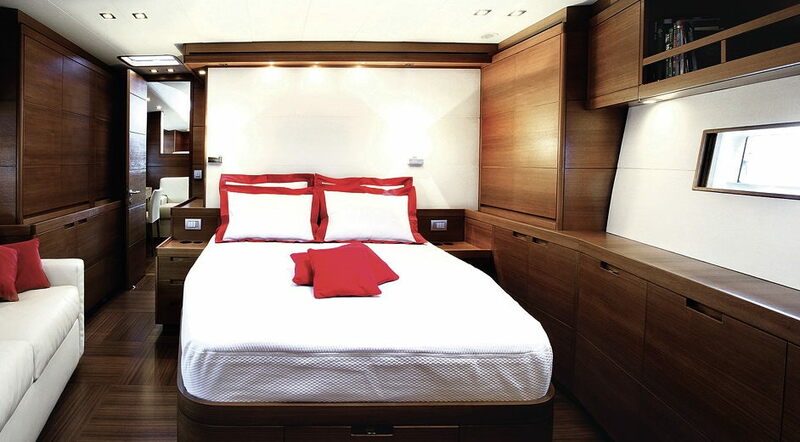 The interior layout follows the classic SWS configuration:- the crew quarters are aft, there are two cabins (with ensuites), and there are a galley and the navigation station. 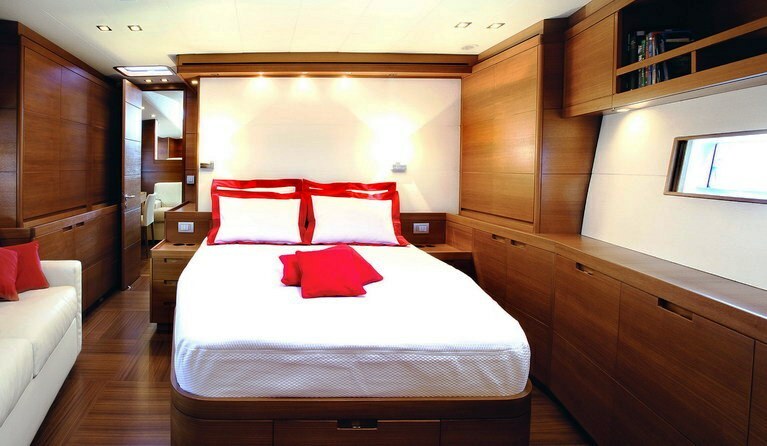 There are two twin guest cabins, both with ensuite, and further forward a VIP cabin which has a double bed and separate bathroom with shower. 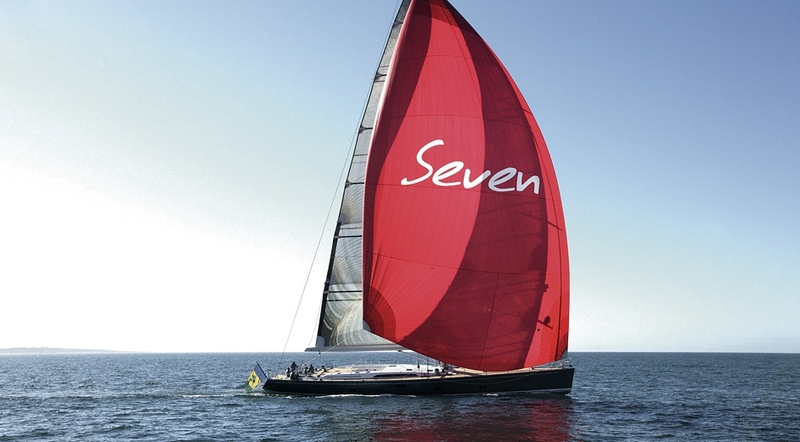 Mrs Seven has accommodation for 8 guests. 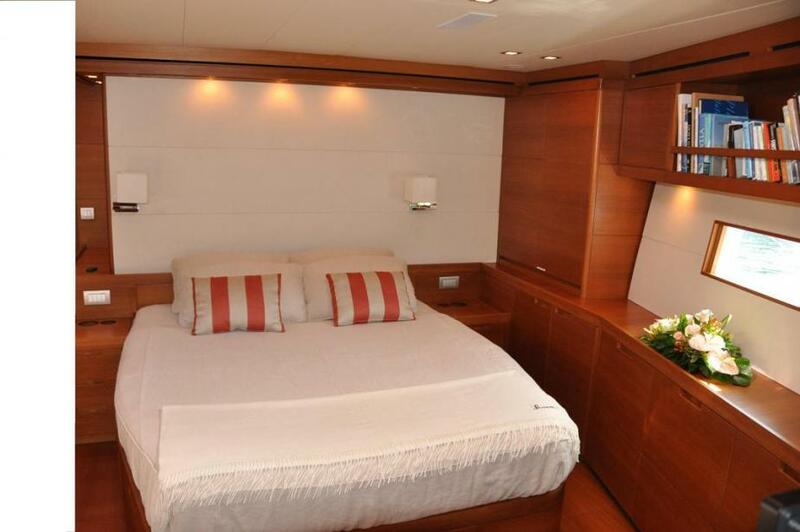 Her Master cabin is forward of the mast and accessible via a studio and she has a double bed, sofa, and ensuite bathroom. 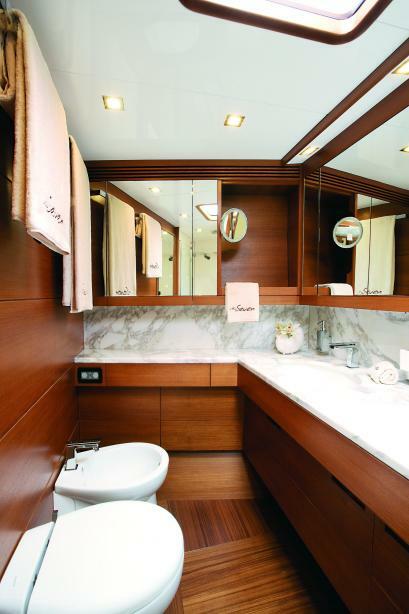 The VIP cabin with ensuite bathroom is also situated forward of the large salon. 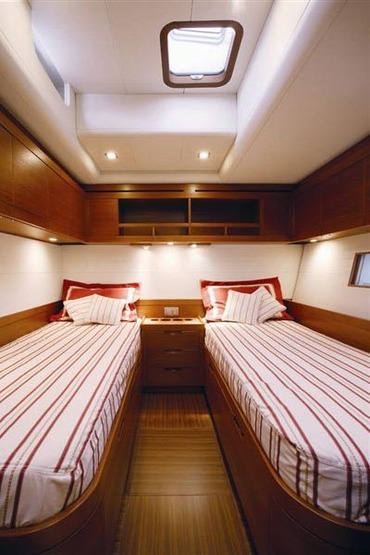 The Two twin bed cabins, both ensuite are located aft of the salon. 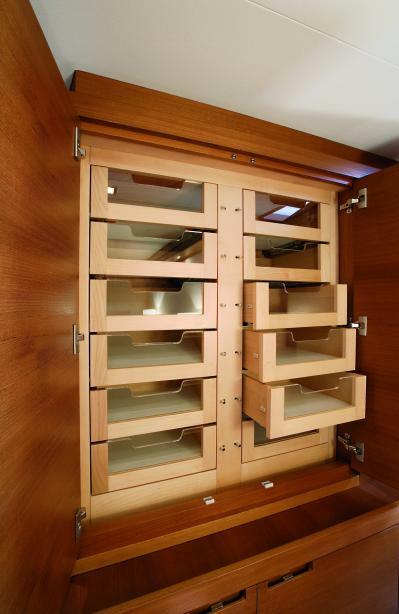 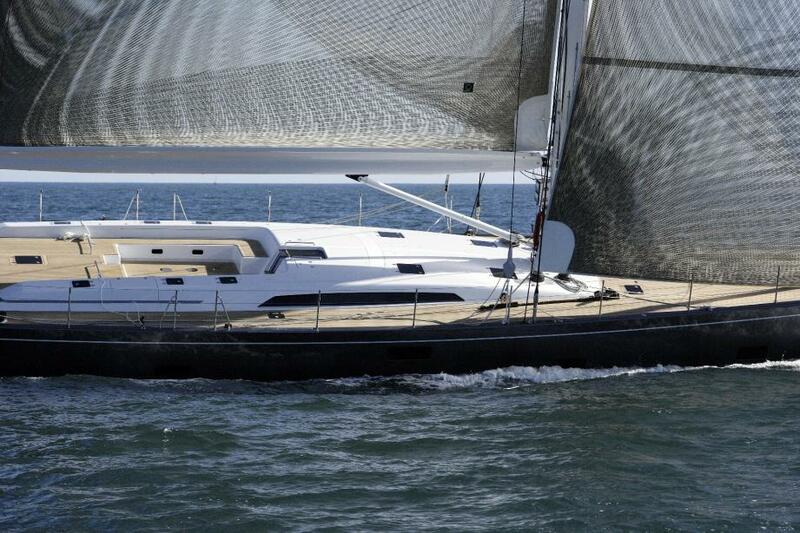 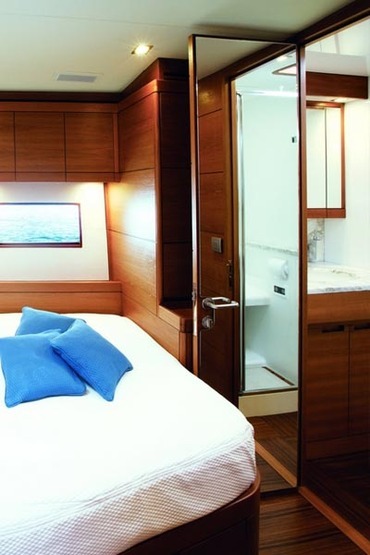 The sailing yacht’s master cabin is forward of the mast and accessible via a studio or study. It has a double bed and a separate bath with shower ensuite The interior layout follows the classic SWS configuration with the 2 crew cabins, the galley, and the navigation station aft. 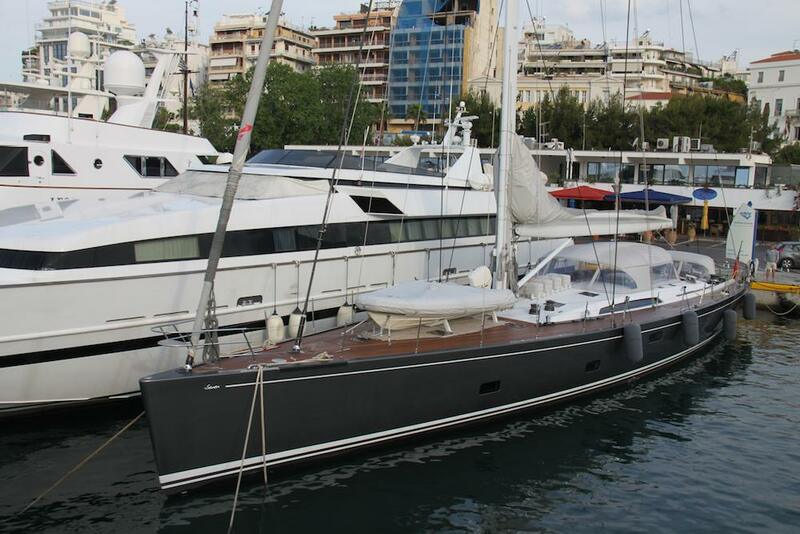 For extras, the following Tenders, Toys, and Amenities are available onboard: Nautica 4.2 m (tender crane winch system) with Yamaha 25 hp, Icom (M801E SSB with GMDSS), Thrane & Thrane (3026D Satcom FBB 250 and Mini-C), Ericsson (W25 HSDPA), Panasonic (Computer, Printer, WiFI high frequency net) Samsung, Sony (Satellite Antenna), Sea Tel C 24 and Sky Decoder TV, flat screen TV in salon, master and galley Stereo: Saloon Audio Denon AVR 2308 home theatre Video DVD Denon 1930, master: Audio Video S302 + I-Pod dock, guest cabins: 3 x Denon S302, galley: Denon System 102. 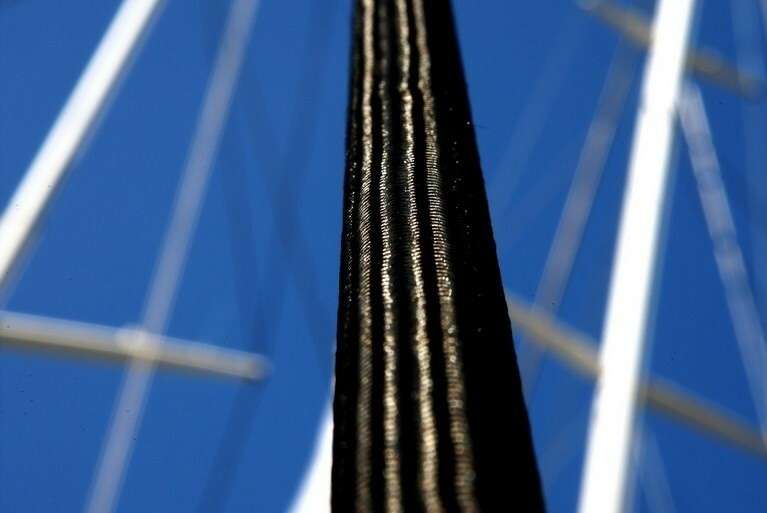 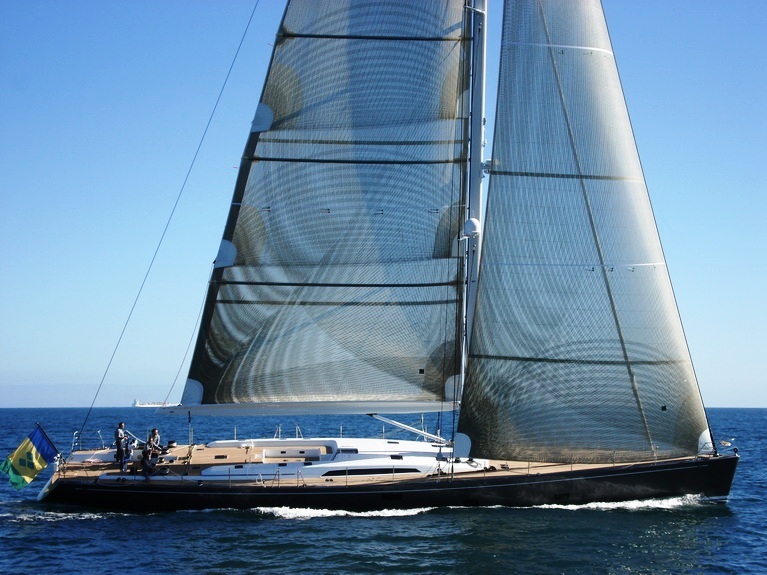 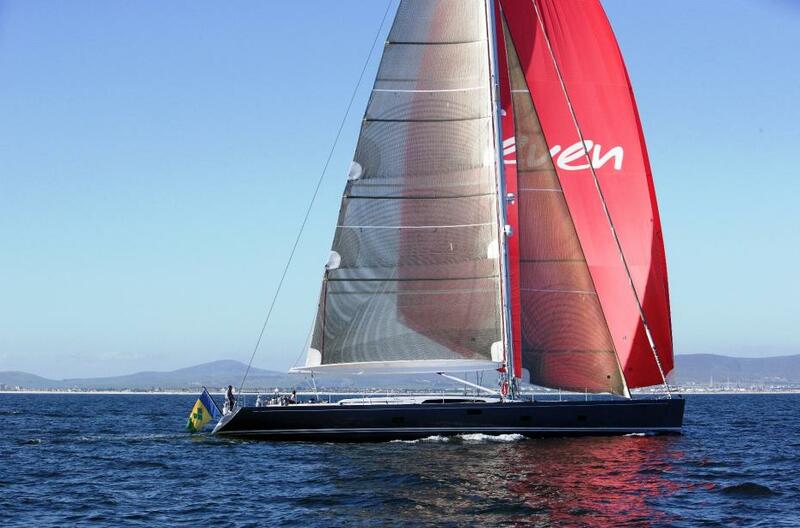 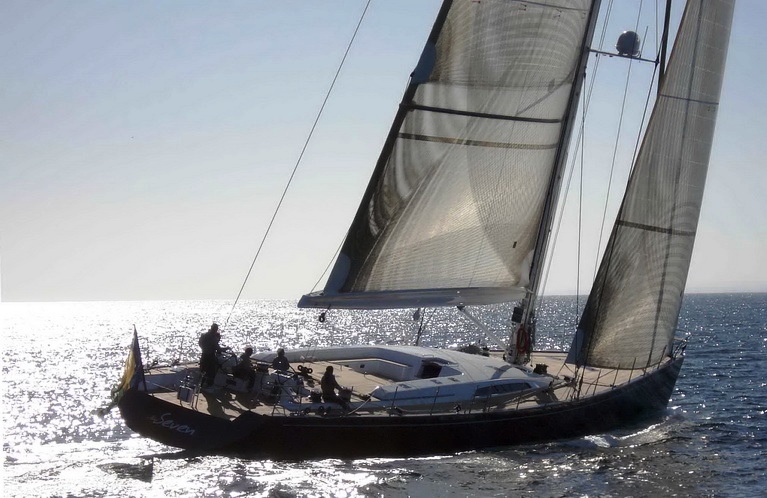 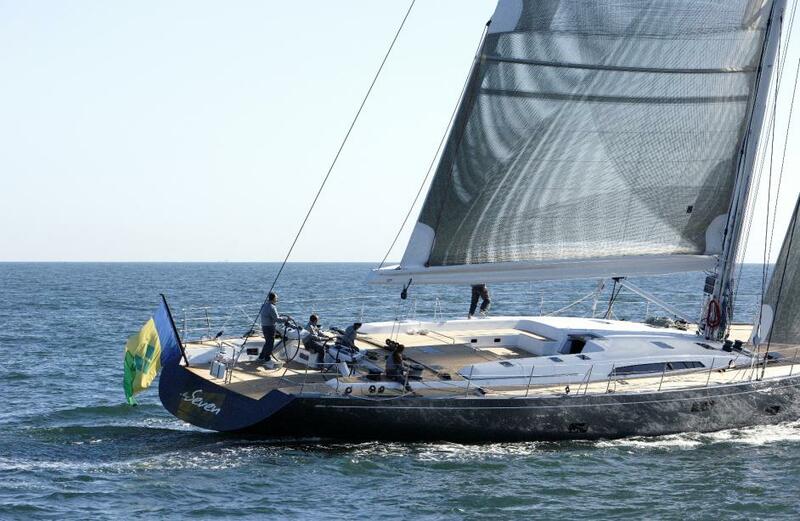 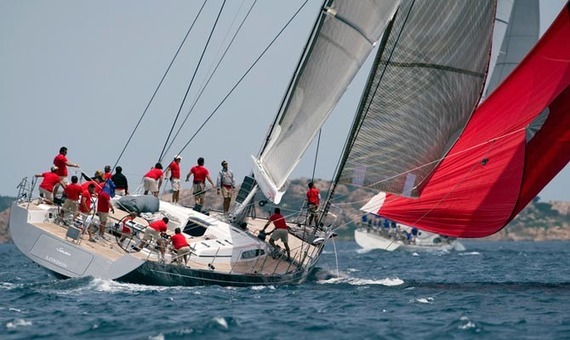 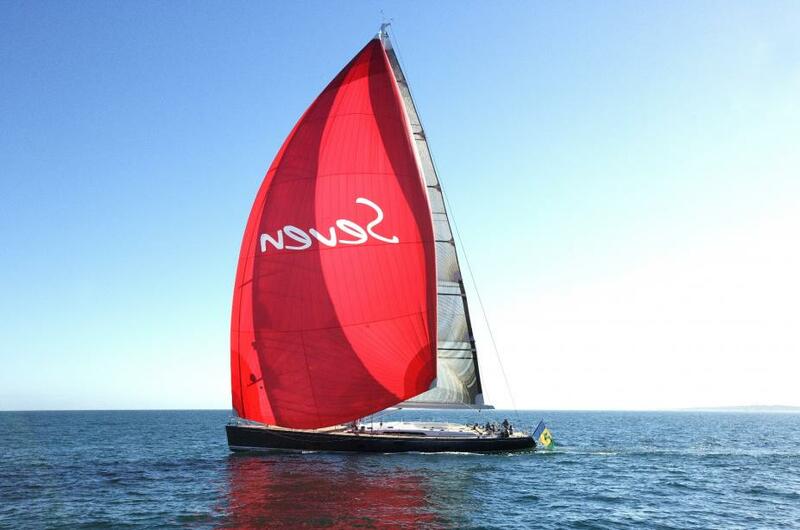 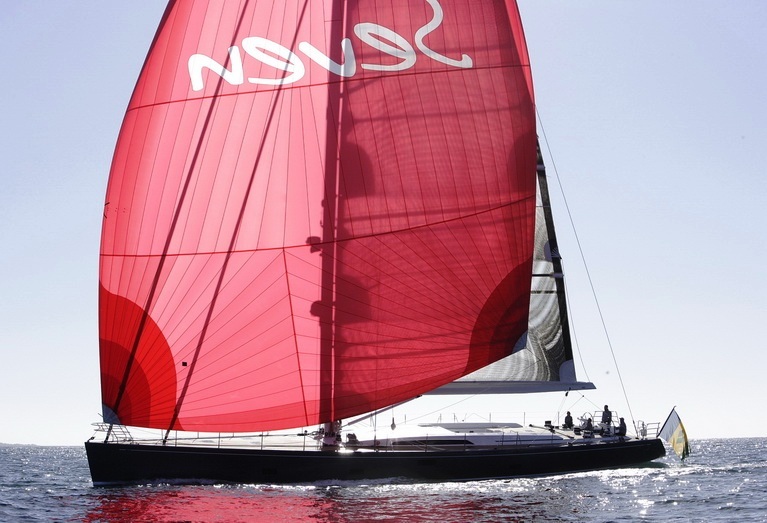 Sails: Quantum S.A. (Fusion Membrane/Vectran Carbon) Sail Area: 424 sqm, Mast, and Boom: Nordic Mast/Carbon Fibre High Modulus, Winches: Harken, Furling System: Rockman/Bamar, Custom Carbon passerelle (dedicated storage).